The Trigger-Happy Penguin: The Great Book Blockade of 2009.
this law is a complete BS. The fact that not many people read and much less buy books right now because they already find it a bit expensive as it is! I've read somewhere that the government saws that due to smuggling of these they didn't reach their expected reveniew. Whata*** and who's fault is that? 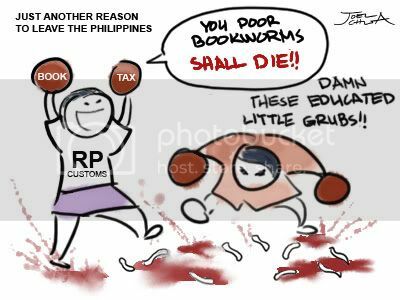 Don't blame the books and bookworms blame the corrupt officials who pockets and accepts bribes. People smuggles books now? really that's something new.